We’re helping clients in North America, Europe and the Middle East to optimise development of unconventional oil & gas plays through improved characterisation of fracture systems. We have wide experience of fracture systems in low porosity rocks, and are actively researching the interplay between natural and induced fractures in relation to stress. Understanding fractures in tight reservoirs is critical for estimation of volumes, development planning, well positioning, and increased efficiency of induced fracture stimulation. Increasingly, companies are realising that an improved understanding of fractures early in the life-cycle of the asset brings maximum benefit. Tight Amin Fm. sandstones (Cambrian) & Buah Fm. 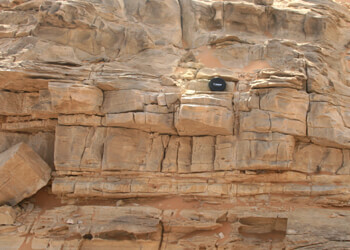 carbonates (Vendian), Oman. Detailed quantitative parameters for fracture modelling, integrated with sub-surface data from deep tight gas plays. Lidar, spatial analysis, fracture network modelling, reservoir modelling. 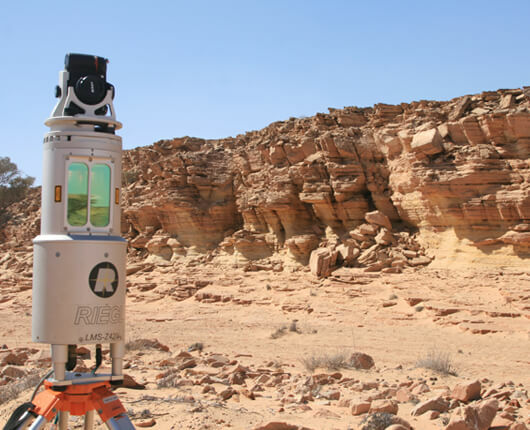 Lidar acquisition from outcrop analogues of Amin sandstones, Oman, for quantitative comparison of the natural fracture network with sub-surface data from deep gas plays. Clients: Large multi-national energy company producing from tight gas plays in Alberta, Canada. Low porosity Cretaceous sandstones and shales exposed in the foothills of the Rockies, prolific productive tight reservoirs in the Rockies foreland to the east. Detailed quantitative parameters for improved fracture modelling of tight gas plays; virtual outcrops to supplement company fieldtrips. Lidar, geospatial analysis, fracture network characterisation. 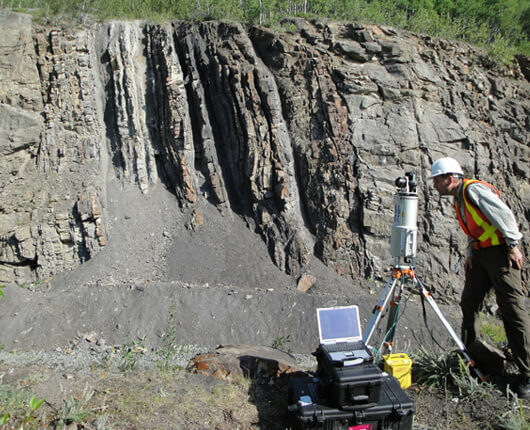 Acquiring lidar data from outcrop analogues to characterise the natural fracture network of tight Cretaceous sandstones, Alberta, Canada. We have invested extensive field time studying fractures in low permeability sediments to measure the observed ranges of values for key fracture parameters that control reservoir performance. This work has helped us to quantify how fracture properties can vary dramatically through different parts of a shale sequence – and once more has reinforced our view that there is no substitute for looking at fractures in outcrop to quantify the likely lateral and vertical spatial heterogeneities in the sub-surface. 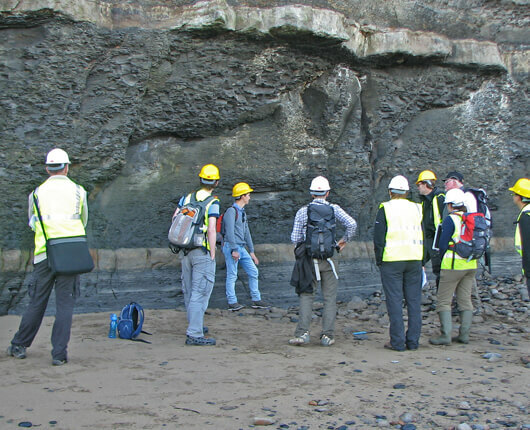 Our active research profile in fracture systems in shale includes a fieldtrip organised for the Geological Society of London’s ‘Year of Mud’ (“Shale: an integrated field and laboratory approach to understanding depositional systems, diagenesis and natural fracturing”), alongside our scientific publication and presentations on shale geomechanics and fracturing. Clients: Multiple oil and gas companies. 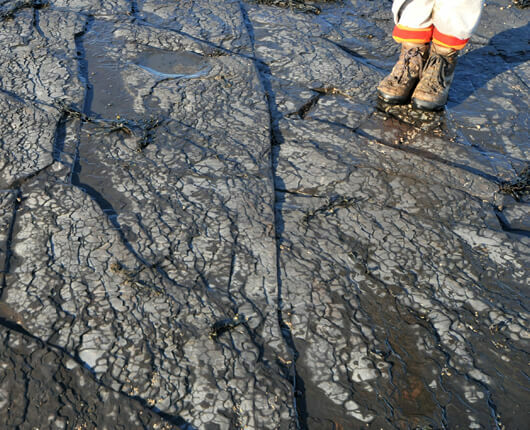 Jurassic shales, Cleveland Basin, North Yorkshire, UK – outcrop analogues for shale gas plays. Detailed characterisation of the natural fracture system to predict fracture properties away from the wellbore (efficient induced fracture stages). Virtual and real fieldtrips. 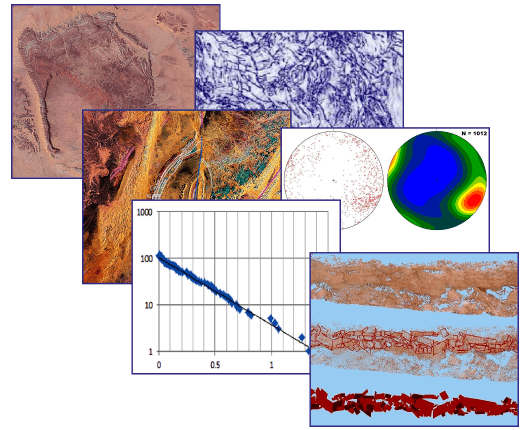 Lidar, terrestrial and aerial photogrammetry, satellite imagery, geospatial analysis, fracture network characterisation. Piano et al. 2012, Daniels et al. 2014, 2015a, 2015b, 2015c, Imber et al. 2014. 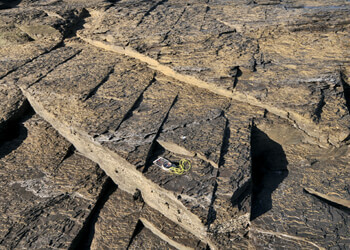 Fractured shales, Jurassic, Cleveland Basin, UK. Hydrocarbons from crystalline rock? Certainly, if a mature source and seal are present, and the basement has sufficient fracture porosity and connectivity. This is a classic ‘Type I’ fractured reservoir, where fractures are critical for fluid storage and delivery – and therefore a comprehensive understanding of the fracture system is crucial for commercial success. Clients: Clair Partnership (BP, ConocoPhillips, Chevron, Shell) funded PhD projects at Durham University. Outcrop analogues for the Clair Ridge, West of Shetland Basin. Characterisation of fracture networks in basement. Satellite and air photo image analysis, lidar, terrestrial & aerial photogrammetry, geospatial analysis, fracture network characterisation. Holdsworth et al. 2009, 2016, Pless (née Martin) et al. 2010a, 2010b, 2012, 2015, Franklin et al. 2010, 2011, 2012, McCaffrey et al. 2016, Utley et al. 2016, 2017, Dichiarante et al. 2016. 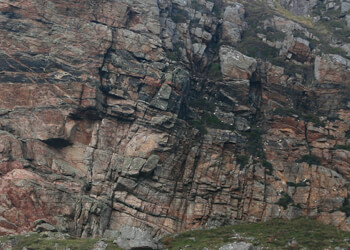 Recording the fracture network in crystalline basement using lidar, Kylesku, Scotland. . Interpreted virtual outcrop model of fractured basement from Kinlochbervie, Scotland (work by GRL for Pless et al. 2015). Perhaps the Zechstein is not a conventional example of an unconventional play! 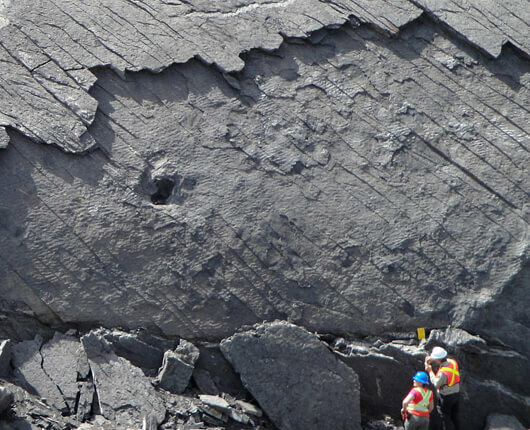 However, production from the Zechstein is highly challenging because of the complexity of multi-phase diagenesis combined with highly variable deformation associated with evaporite dissolution. See here for more details of the cross-disciplinary approach that we have used to analyse the Zechstein. 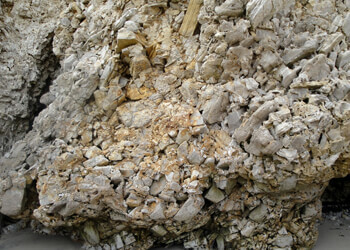 Zechstein outcrops in NE England as analogues for carbonate reservoirs in the Permian Basin of NW Europe. Multi-disciplinary characterisation of connectivity within complex Zechstein reservoirs. 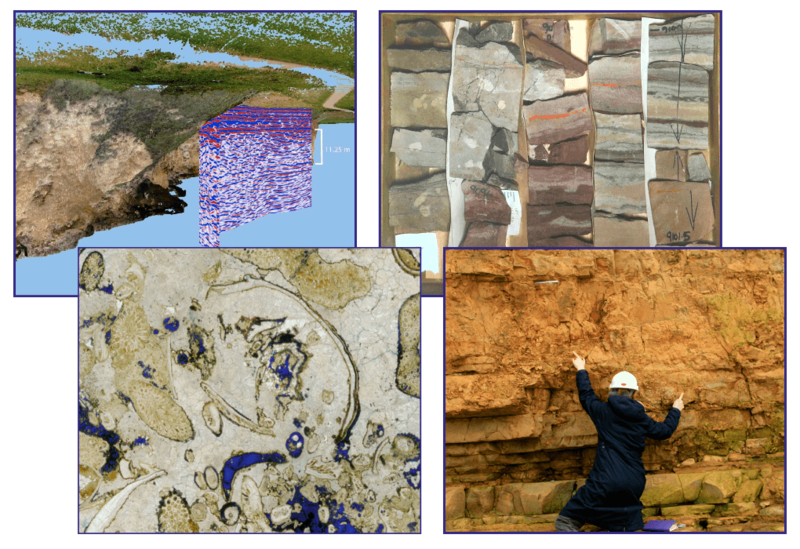 Lidar, photogrammetry, fracture network characterisation, GPR (ground penetrating radar), structural analysis, sequence stratigraphy, sedimentology, integration of sub-surface & production data, and more. Daniels et al. 2016. Further info here.